Organizations and researchers across the private and public sectors have learned much from advances in the use of analytics to assess a vast and growing volume of information. “Big data” enables understanding of patterns and anomalies with far greater speed and accuracy, and has been used to help government make more informed decisions in areas ranging from social service delivery to global threats. Yet while big data has been the source of significant advances, its very nature does not capture deep context about the people and places who benefit from the actions taken based on the analysis of big data. The author reviews the differing strengths and limits of big and thick data, and suggests that governments can improve results by combining the breadth of big data with the depth of thick data—an integrative approach that she calls “mixed analytics,” which can increase accuracy in interpreting big data by adding contextual knowledge about citizen concerns. The World Bank Social Observatory’s p-tracking (participatory tracking) project among 32,000 village residents in India. The USDA Animal and Plant Health Inspection Service’s tailored social marketing campaign. The LA Express Park program, featuring dynamic pricing, in downtown Los Angeles. The report concludes with a set of lessons learned and recommendations for government leaders. Specific lessons learned include the fact that big data is a means to an end that can be informed by thick data, rather than an end itself; thick data can identify unexpected problems or previously unexpressed needs; and mixed analytics can offer both scale and depth. 1. Make data and technology relevant to the people who use it. 2. Leverage thick data at appropriate stages of the problem-solving process. 3. Build an interdisciplinary team of quantitative and qualitative experts who work closely with stakeholders. 4. Combine big and thick data to improve communication. 5. Improve government agencies’ knowledge of mixed research methods. 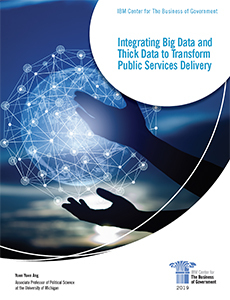 At a time when the US and other governments continue to enhance their use of data as a strategic asset for transformation, we hope that Professor Ang’s report provides useful insights for government managers and stakeholders.